Since the last newsletter, one dictionary entry was added: quantum hologram, former astronaut Edgar Mitchell's explanation for his beloved psi. I've added a mini-lesson in critical thinking on the topic of opinions. Two book reviews were added: one of Michael Shermer's Mind of the Market (thumbs down) and the other of Gary Schwartz's Afterlife Experiments (thumbs down). The latter is based on notes I used when I taught a class on critical thinking about the paranormal, and required my students to read both Dean Radin and Schwartz. You may think I'm a masochist for going through Radin and Schwartz in great detail, but my students were convinced I'm a sadist. I've revised the Bridey Murphy and the reiki entries. A half-dozen posts were made to my Skeptimedia blog: suicide and journalism, media mediocrity (major magazines interviewing people who don't know what they're talking about), the psychic who isn't (Gordon Smith), more interviews with people who don't know what they're talking, but can keep a scandal alive: Larry King interviews Tonya Harding about Gary Condit), Scott Pelley and other liars at "60 Minutes" (on cold fusion), and violence becomes second nature. Several posts were added to my What's the Harm? blog: more grief caused by Sylvia Browne; when fear is the basis for law, justice leaves by the back door; cell phones may not cause brain tumors, but they can still be deadly. Several reader comments were added: a reader thinks 11,000 years isn't long enough for the evidence to be discovered to prove Plato's story about Atlantis; a reader has convinced himself he's had psychic experiences; a reader thinks reiki works by the placebo effect; a reader thinks that if Edgar Mitchell thinks psi exists, the rest of us should pay attention; a reader is convinced his OBE was real and had nothing to do with sleep paralysis; and a reader thinks auras might have something to do with pheromones. Many files were updated since the last newsletter, including the last newsletter itself. Also updated: Maya prophecy (to include a quote of the one line in Maya that refers to the end of one of their calendars and is being exploited by merchants of fear as a prophecy for the end of the world or some other calamity); psychic (to include a link to an article about Oprah interviewing a pet psychic who helped find a dog); anti-vaccination movement [AVM] (to include a link to know-nothing, anti-vaccinationist Jenny McCarthy being given her own show by Oprah, and links to two blogs that respond to nonsense put out by the AVM); atheism (to include a link to a NY Times article about the rising chorus of atheist voices); organic food (to include a link to a story about the creation of genetically modified corn fortified with three vitamins); Matthias Rath (to include a link to a chapter from Ben Goldacre's Bad Science, that was omitted in the first edition due to legal issues; the Young Thinkers page (to include a link to a new online library from the journal Nature); pyramid schemes (to include a link to an article about cash gifting); and vampires (to include a link to an article about a posh Boston school where rumors abound). Ever hear of the Australasian Journal of Bone and Joint Medicine? According to The Scientist, pharmaceutical giant Merck created this phony journal to publish favorable-looking data for its products. Merck allegedly paid Elsevier to publish the "journal." Blog.Bioethics.net has the story. I was ready to cut Big Pharma some slack, too, after reading a New Yorker article by Jerome Groopman on some good work being done by pharmaceutical researchers and other scientists trying to relieve the suffering of those with cystic fibrosis. My good will didn't last long, though. There's a long section on Big Pharma in Daniel Gardner's The Science of Fear that put me in a negative frame of mind again. I won't belabor the point, but I must remind the millions of men out there who use Cialis, Levitra, or Viagra that you may not have ED: you may be IMPOTENT. Furthermore, even though common sense tells many critics of Big Pharma that it is economically beneficial for Big Pharma to make us all sick, it's not true. Big Pharma's economic interest is in making us think we're sick. It's in Big Pharma's interest to keep us alive for a long time so we can continue to buy drugs for many years. First, however, we must be convinced we need the drugs. "Disease mongering," or inventing illnesses and providing the cures, is one way Big Pharma can grow its products. Gardner gives several examples taken from Selling Sickness: How the World's Biggest Pharmaceutical Companies Are Turning Us All Into Patients: irritable bowel syndrome, restless leg syndrome, shyness, erectile dysfunction. Oh, we already mentioned IMPOTENCE. Some people who watch TV ads may think high cholesterol is a disease. The techno-jargon for disease mongering is the pathologizing of normal biological and social variation. Turning risk factors for a disease into a disease itself also qualifies. Even so, I was ready to cut Big Pharma some slack since they don't seem to be doing anything different from many other capitalist enterprises in a free market. They create needs where none existed before and then supply a product that fulfils that need. Isn't that what many businesses do in a free society? Big Pharma is just one in a long line of merchants of fear who provide products we don't need for a price we can't afford. Think of all the industries that try to scare us into using their products. Start with religion and then work your way down through sanitizers to deodorants and insurance. Isn't the business of most advertising to create anxiety and promise a way to relieve it? So, how is Big Pharma unique? According to Gardner, Big Pharma's disease mongering is "much bigger than advertising. It's about nothing less than shifting the line between healthy and diseased, both in consumers' perceptions and in medical practice itself." Frankly, what matters to me is that my doctor not be duped by Big Pharma. Whether my neighbors or their doctors are duped about illnesses created by the marketing department at Pfizer or Merck isn't of much interest to me. What do I do next? Attend the Skeptic's Toolbox. One suggestion is to separate atheism from skepticism. I agree insofar as this simply means don't assume every skeptic is an atheist. In fact, I don't think you should assume that every atheist is a skeptic, either. Religious claims, including the claim that some sort of god or gods exist, should be considered fair game for critical analysis, however. One of the greatest skeptics who ever lived, David Hume, attacked natural religion with great gusto. He had no qualms about providing a scathing critique of the basis for revealed religions like Judaism and Christianity: miracles. Hume also questioned the possibility of ever knowing anything about the external world, while fancying himself the Isaac Newton of psychology. Go figure. Many of the suggestions Loxton gathered involve promoting science and critical thinking about "extraordinary claims." We shouldn't forget that not all scientists are skeptics. Some are very religious, such as Francis Collins (who is one of the scientists making major contributions to the fight against cystic fibrosis, among other things). Some are actively applying science in an attempt to confirm their beliefs about paranormal phenomena. Yet, two of the three main skeptical organizations see promoting science as one of their main tasks. The subhead to Shermer's magazine and his website reads: Extraordinary claims, Revolutionary Ideas, and the Promotion of Science. (I'm not sure whether Shermer means he promotes or critiques "revolutionary ideas." In fact, I'm not sure what he means by the expression.) Kurtz's group says on its website that "The Committee for Skeptical Inquiry promotes science and scientific inquiry, critical thinking, science education, and the use of reason in examining important issues." If you follow CSI, you know that one of those important issues is secular humanism. Randi's group says it's an "educational resource on the paranormal, the pseudoscientific, and the supernatural." The JREF refers to its annual meeting as "a conference on critical thinking." I have a bit of a quibble with the emphasis on promoting science and science education as goals of skeptical organizations. My perception of skepticism is that it is one of several critical thinking tools. Critical thinking should be applied to science as well as to politics, religion, or any other field that makes claims about reality. The stated goals of the JREF are more in tune with my personal philosophy regarding skepticism, which, by the way, has very little connection to philosophical skepticism in either the Pyrrhonist or the Academic tradition. We should be promoting a healthy skepticism, not the kind of cynical, selective skepticism that leads to such things as holocaust denial, HIV/AIDS denial, climate change denial, Mayan doomsday prophecy notions, and 9/11 conspiracy theories. It's inevitable that the (non-philosophical) skeptical movement would promote science, since so much of our activity is aimed at exposing the errors and delusions of pseudoscientists, quacks, and cranks. Science points the way to correcting these errors and delusions. But, science isn't the only discipline that points the way: logic and critical thinking are also essential. If I want science, however, I usually go to a science book, website, or podcast, not a skeptical site. (My favorite podcast, for example, is The Naked Scientists. The hosts of this program never mention skepticism. My favorite blogger is Dr. Ben Goldacre, who may speak at skeptical conferences, but does not promote himself as a skeptic. He presents himself as a scientist and critic of those who promote medical garbage. As far as I can tell, he has no interest in critiquing paranormal claims or even non-medical pseudoscientific claims.) To me, science is a tool to be used in the fight against superstition, quackery, and woo. My goal is not to promote science, but to demote crap. Insofar as science helps me in that task, I'm pro-science. But scientists sometimes promote crap, too. Sometimes they commit logical fallacies. Sometimes they are led by their guts instead of their heads. Sometimes they lie, cheat, and deceive themselves. Sometimes they publish papers that need to be critically debunked even though they are published in peer-reviewed journals. Clearly, as skeptics we must promote scientific methods of evaluating the world around us, just as we must promote critical thinking. Promoting scientific methods is not the same as promoting science. Even practicing scientists don't follow the methods of science at times. When they don't, we should criticize them. Thus, I am very pleased to promote the next Skeptic's Toolbox, which will focus on the scientific method. If you are wondering what you might do to help in the fight against woo, I suggest that if it is at all possible for you to be in Eugene, Oregon, next August, you sign up for this conference/workshop. You won't get to rub elbows with famous celebrities like you do at TAM, but you will be rubbing elbows and sharing ideas with the best faculty on the planet for understanding skepticism, scientific methods, and critical thinking. And, you won't get lost in the crowd. As a bonus, you won't be that far from Crater Lake, one of Earth's most amazing places. Did you research the experiment you wrote about? What conclusions do you think we can draw? You should probably look through this experiment and discuss it [in "Is Gordon Smith Psychic?"]. The reason being that if he was able to be over 90% (the claim) accurate under triple-blind conditions you might have to revise your cold reading conclusion. There has been no response to this experiment which seems to be completely full-proof [sic]. They also conducted another well-controlled double-blind experiment which had highly significant results as well. Read the last couple paragraphs. Apparently, he is subscribed to that journal so he must have read the report. So what did he conclude? We don't know, he never mentioned the experiments again. I suspect you are good friends with Randi and can probably call me [?] up or get a quick email back from him. Could you ask him about the experiment and what he makes of it? -Roy, A. E. and Robertson, T. J.. (2004) Results of the application of the Robertson-Roy protocol to a series of experiments with mediums and participants. Have you heard of the Scole Report? There has not been one word from any skeptic about this. For the record, I have heard of the Scole report. I've even collected a significant amount of preliminary data for a potential entry in The Skeptic's Dictionary. Also for the record, I don't plan to look at the articles in the Journal of the Society for Psychical Research concerning the testing of another psychic. I certainly will reconsider my position on psychic ability if I'm shown convincing evidence. The e-mailer should do his own analysis, in any case. Since it is impossible for me, or anyone else for that matter, to review and critically evaluate every report of psychic ability, I must admit that no matter how many studies I have investigated, there will always be at least one more that awaits investigation. Nobody could examine all the cases for belief in mediums, ghosts, reincarnation, miracles, stigmata, angels, astral projection, out-body-experiences, scrying, etc. There are too many cases, for one thing. More important, even if I examined a thousand cases of each type and found the evidence insufficient in each one, it would still be possible that the next case would be authentic. I call this the problem of the never-ending quest, or NEQ for short. I think Randi calls it the unsinkable rubber duck problem. It might seem that we could settle the issue of Gordon Smith's psychic ability by testing him under controlled conditions. Hasn't this issue been settled once and for all by the well-designed, controlled experiment cited by our correspondent? The answer, unfortunately, is no. There are irresolvable issues with all such experiments. Believers think the experiment proves Smith has psychic abilities. Skeptics disagree. Some skeptics, for example, might claim that the experiment wasn't designed properly or didn't have proper controls. Some might find fault with the method of judging. Some might find that the researchers did not provide sufficient safeguards against sensory leakage. Some researchers claim that “any well-controlled test of mediumistic ability should not allow for the sitter to provide verbal feedback to the medium during the reading” (Wiseman and O’Keefe). Other researchers reject such criticism as biased, and say it's impossible to eliminate all sensory input. Some parapsychologists, like Gary Schwartz, believe "to the best of our knowledge, there is no scientific evidence" that cold reading or other naturalistic methods that use only subtle cues like tone of voice, inflection, etc., can generate the specific kinds of information the mediums in his tests provided (Paranormal Review, October 2001). Skeptics can usually explain much of what goes on in a reading by appealing to cold reading and subjective validation. Cases of fraud are not unheard of, either. Anyway, I've investigated Schwartz's claims in his Afterlife Experiments, as well claims by Rupert Sheldrake and many others. Enough is enough. In short, if I were to do a full analysis and investigation of the reports about Gordon Smith and the alleged psychics in the Scole report, and were to find them lacking, I would immediately be met with another report claiming that someone else is the real thing and such and such study proves it. The reports are like Hydra heads guarding the gates of Hades. Whack one off and two more grow in its place. Some might think that Joe Nickell’s many investigations into haunted places, all of which (as far as I know) have resulted in finding naturalistic explanations for alleged ghosts, prove that ghosts probably don’t exist. All they prove is that experiences many people thought were supernatural or paranormal were actually psychological, physical, or fraudulent. But even if Nickell found a naturalistic explanation for every ghost experience that has ever occurred, it would still be possible that ghosts exist (the NEQ). It would still be possible that the next case is the authentic one, the one true believers have been waiting for. It's not as if I haven't read any of the psi research. (See A Short History of Psi Research and my review of the work of Dean Radin and Gary Schwartz, or my review of the ganzfeld experiments and the PEAR number crunching). Until I am shown evidence that has better bona fides than being published in the Journal of Psychical Research, I have no reason to do any further investigation of Gordon Smith. As far as the Scole report goes, my notes indicate that it's not worth pursuing. (In my notes I compare it to the work of Gary Schwartz, which is my way of telling myself that it is next to worthless.) True believers should thank me for that. They can always hold out hope that the Scole report succeeds where thousands of others have failed. If that's the thread they wish to cling to, let them hang by it. Why do scientific studies contradict one other? Ever wonder why today's news story about your favorite food, activity, or supplement contradicts the one you read last month? Wonder no more. The reason is two-fold: the media don't read scientific papers and scientists don't do enough large, randomized studies. Journalists are likely to base their stories on press releases regarding small studies. When scientists do large randomized studies, the results often show that despite the promise of smaller studies, nothing much is happening with those vitamins, vegetables, or fatty meats. Even that bacon you've been told is bad for you turns out not to have a whole lot of evidence behind it. For more on this story, see The Science of Fear, DC's improbable science, and "Science and Pseudoscience in Adult Nutrition Research and Practice" (Reynold Spector, Skeptical Inquirer, May/June 2009). Spector, for example, claims that when large randomized studies have been done on the following, each of which has been touted as beneficial in reducing the risk of cardiovascular disease, the results have not supported their value: hormone replacement therapy, reducing blood homocysteine with B vitamins, low fat diets, megavitamin E supplements, or omega-3 fat supplements. Large scale randomized studies have not found any benefit to preventing cognitive decline by taking various vitamins or to preventing cancer with omega-3 fat supplements, dietary fiber (for bowel cancer), lycopene and megavitamin E (for prostate cancer), or folic acid (for bowel cancer). Many media outlets recently reported something similar to the following: "A recent study confirms that higher consumption of red and processed meat increases the risk of cancer, heart disease, and other related illnesses. "* The study was a prospective study (so it did not use randomization) published in the Archives of Internal Medicine. It was certainly large enough: more than 500,000 subjects. The actual conclusion of the study was: "Red and processed meat intakes were associated with modest increases in total mortality, cancer mortality, and cardiovascular disease mortality." Some of you might recognize that being "associated with modest increases" is not the same as "increases the risk of." The latter expression implies causality. How many times must it be stated? Correlation does not prove causation. We're told by the scientists that there was a "modest" increase in mortality among the heaviest red and processed meat eaters. How much is a modest amount? Compared to what? One of the researchers in this study, Dr. Rashmi Sinha, is quoted as saying: "11% of deaths in men and 16% of deaths in women could have been prevented if red meat intake had been lowered to the same amount as the lowest intake group." I assume Sinha was speaking of deaths during the study (which took place over a ten-year period). Sorry; there is no way Sinha could know that, nor could Sinha know how much longer those people would have lived had they not died during the course of the study. First place goes to H3 Tec, promoter of nano-ionic resonance as the key to detecting the presence of stuff. The H3 Tec is the latest replacement for the Quadro Tracker and the DKL Lifeguard. You have to wonder why there are still undetected roadside bombs going off in Iraq. This fantastic device should be detecting them without fail. In any case, after this endless war, the devices can be used to find lost golf balls or dentures. Second place goes to Fr. Hugh Sweeney, Catholic priest stationed in a remote corner of county Donegal, Ireland. His award comes not from physically or sexually abusing his parishioners, nor for tirelessly preaching the virtues of staying married no matter how miserable a couple might be. Nor does he earn his honor for preaching eternal torments in hell for those who have impure thoughts or dishonor their abusive parents. No, Fr. Sweeney's award is for MLM harassment for telling his parishioners that his product, noni juice, can cure cancer. 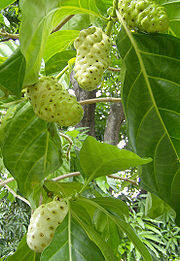 For those who don't know, the noni is a foul-smelling, foul-tasting fruit that cannot cure cancer (despite Fr. Sweeney's claim that it can), but it is an excellent source of carbohydrates. Sweeney's not alone in promoting noni juice as a cure-all. Several years ago, while touring the Waipiʻo valley on the Big Island, our guide picked a noni fruit from the ground, opened it, and let us have a whiff. He mentioned that people were paying good money on the mainland for noni products. Someday, I said, while looking at a nearly dried-up waterfall, I'll write about the noni. Little did I suspect that an Irish priest would be my stimulus to put finger to keyboard. Third prize goes to Andre Saine and Molly Punzo for claiming that many deaths from Spanish flu in 1918-19 were prevented by homeopathy. They claim they have records that show that 0.7 percent of those treated by homeopathy died, compared to 30 percent or more of those who were untreated or treated with conventional care. Homeopathic remedies are little more than water, so they might quench your thirst but they are not going to prevent a virus from attacking your body. Wikipedia says: "The global mortality rate from the 1918/1919 pandemic is not known, but it is estimated that 2.5 to 5% of those who were infected died." The epidemic was worldwide and record keeping was sketchy at best. Where Saine got his data is not mentioned by Punzo, who is promoting homeopathy to combat the so-called Swine Flu on the basis of Saine's alleged research. Personalysis. This is another fad in the mold of the Myers-Briggs Type Indicator. I once heard from a fellow who worked on an oil rig in the North Sea. He claimed that his bosses made all the workers take the MBTI and assigned them colored badges: 16 colors for the 16 types. Personalysis goes a step further (or back) and instead of providing an Omar-the-astrologer type reading in paragraph style, the client is presented with a "colorgraph" that allegedly represents the results of a personality questionnaire. The data is depicted as colors, shapes, and numbers. Allegedly this enables people to "understand differences, grow, and manage others. Colorgraph images throughout the workforce serve as visual clues to help people stay on target. "* Personalysis is debunked by Ben Radford in the May/June 2009 issue of Skeptical Inquirer. Don't confuse personalysis with personology. The latter is a New Age variation of the ancient pseudoscience of physiognomy and was invented by a judge in the 1930s. Personalysis was created by a behavioral scientist at the University of Houston in the 1970s. Both personalysis and personology rely on subjective validation for whatever credibility they have achieved. 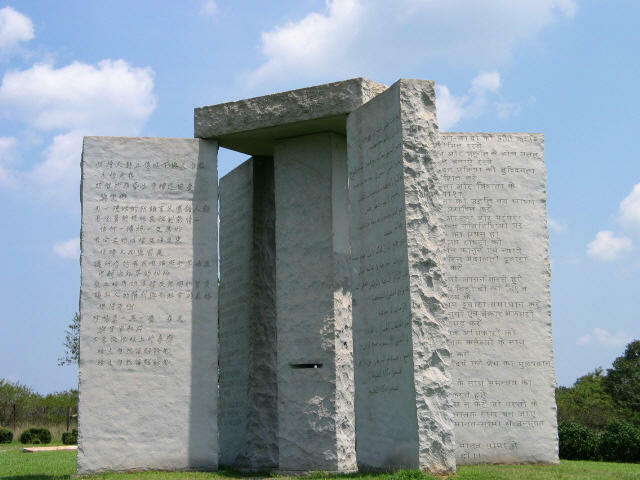 The winner is the Georgia Guidestones. Erected in 1980 to guide us in a new age of reason, the first guiding message says we should keep the world population to under half a billion. I don't know what we were at in 1980 but I'm sure it was well over the recommended minimum. We're now at over 6.77 billion. The granite stones are located in Elbert county, Georgia, an area known for its granite. For more information, see the online 50-page pamphlet written by the president of the granite company that built the monument. Or read a recent article in Wired or the one in Wikipedia. be not a cancer on the earth. Astronomers have observed a "Lyman-alpha blob" that is 55,000 light years across (as large as present-day galaxies) and 12.9 billion light years away. Young earth creationists shrug and say, "but that's not in the Bible." The percentage of younger Americans who say they have no religious affiliation has skyrocketed from between 5 and 10 percent to between 30 and 40 percent, according to pollsters who keep track of such stuff. In 1952, the anti-communist/pro-Christian Congress of the United States, decided we should have a day when we all pray for our country. Ronald Reagan established the first Thursday in May* (probably in consultation with Nancy's astrologer) as the national day of prayer. About the only established benefit to prayer is that it makes those who pray feel like they're doing something important when they're talking to themselves. Whatever happened to the idea that our government isn't in the religion business? It's time to get rid of this useless day. Why not replace it with national critical thinking day? Just kidding. We all know that anyone who wants to pray can do so any time he or she feels like it. Congress can't get rid of this ridiculous prayer day, however, because it would mean the members would lose votes. They have to placate the evangelical fringe. At least President Obama didn't sponsor a religious service at the White House on May 7th. Some might call that progress. On the other hand, he signed a proclamation in honor of the day. How can Congress get away with promoting a religious practice? Aren't they violating the First Amendment's prohibition against making laws with respect to religion? No, because they didn't pass a law, they passed a resolution or a proclamation or some such thing. There is no punishment for not observing a national day of prayer. Why not ask Congress to sponsor a national day of finger-crossing or knocking-on-wood? What I can't figure out is why stating the truth – that creationism is religious, it is superstitious, and it is nonsense – violates anyone's rights. It doesn't prevent that religious/superstitious person from believing or discussing this apparent nonsense. The teacher was simply expressing the truth. And now the requested remedy is to prohibit the teacher from making similar comments in the future? So the legal solution is to stop the teacher from speaking the truth? Instead, there should be a banner hung in every school science classroom stating clearly that "Creationism is religious, superstitious nonsense." It's time to tell the truth and put religion back in the churches, not in schools. Maybe we should ask Congress to proclaim April 1 as national superstitious nonsense day.